The steps of the St John’s Co-Cathedral were graced with a spectacular performance by a choir made up of more than a hundred singers, led by Pamela Bezzina. Elfejn u Tmintax was accompanied by innovative lighting effects by Mad About Video, which illuminated the façade of the centuries old Co-Cathedral. The choral symphony was accompanied by an exciting singing collaboration – that between Glen Vella and Amber Bondin, who were the lead vocalists in Elfejn u Tmintax. The music was composed by Elton Zarb and the lyrics, written by Joe Julian Farrugia, included quotes from the bible, Saint George Preca and Malta’s National Poet, Dun Karm Psaila. The symphony took spectators on a journey across Malta through the ages. It was made up of four movements, with the first focusing on our land and our peoples, namely on the lifestyles of our forefathers, their jobs, their traditions, games and superstitions. 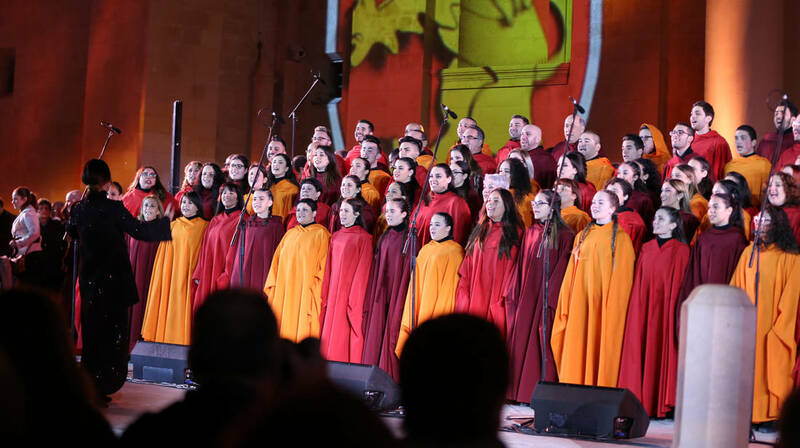 The second movement focused on beliefs and hope, and highlighted Malta’s beliefs through the ages and how these transformed over time, especially through St Paul’s journey to Malta. Following this was the third movement – the sea that surrounds and unites us – which focused on the sea and aspects related to it. Valletta and Europe were the themes of the final movement, with the year 2018 and the mish-mash of cultures being the focal point.